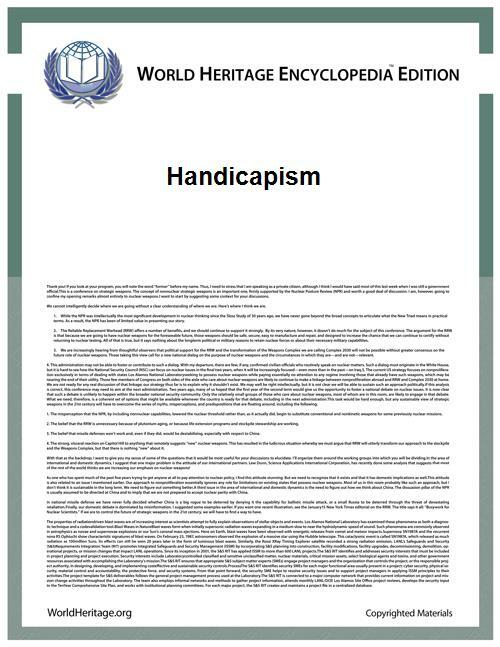 Handicapism is a sociological term, which describes a theory and a set of practices that promote unequal and unfair treatment, discrimination and oppression of peoples with apparent or assumed disability, a concept like to racism or sexism. Here, people are categorized by the type of apparent or assumed physical or mental disability and at the same time on this basis assigned each of the groups certain abilities, skills, and/or character traits or denied. (The affiliation to the respective category of Disability as a fundamental determinant of human abilities and characteristics: For example, all autistic people are emotionally cold or are good in calculation; "mentally handicapped", but have a good heart, a sunny disposition, etc.) Initially, it is not necessarily a negative label. These stereotypes in turn serve as a reason for handicapism practices and have an influence on the attitudes and behavior towards the people of the respective group. Also the labeling has effects on the person in each category. Their options for action are limited, and the person's identity changed. being spoken for them and, at the same time, spoken about them, as if they were not present, . when communicating used by the first name instead Mrs. or Mr.
heaped exaggerated praise for people with disabilities as if they were still children, the performance is designated as extraordinary, unbelievable because the disability. A comment, actually reserved for Jews and Blacks: Have you ever heard: "Some of my best friends are disabled?" A woman who smiles a lot, they say, "It is so good that you can still smile. Heaven knows, really You don't have cause for joy." With the label "disabled" results in a no win situation. If a person fulfills the cliché, it is a poor, sad person with a heart of gold, one expects gratitude and a desire for pity and charity. If the person succeeds in breaking the stereotype, she is regarded unusual, a rare case, amazing. mass media:Ugliness and beauty are not only defined arbitrarily, they also serve as evidence of good and evil. Ugliness is equated with violence and fear, a popular subject of horror films. And characters like Captain Hook, promote the fears of children against disability among adults. Disabled people as helpless objects of charity, compassion, disability presented as a cost factor to raise funds + resulting benefits are referred to as a privilege. Humans, of which is conceived, who that they are less able than others and therefore suffer (and because of their generally constitutional), must be helped - if concrete given - are (Time, attention, educational effort, care, financial support, etc.) They are seen as useless and incapacitated they should behave patiently and gratefully. They are not allowed to formulate causes or suggestions. Handicapism implies incompetence, and handicapism developed incompetence, by denial of decent work is created dependency. Cycle-like, the attributed inefficiency of the receiver confirmed itself. Each person will be assigned multiple roles in society. Handicapism causes different role expectations are overlaid, as well as gender roles, so that people with disabilities are often perceived as sexless beings. ^ Wüllenweber, Ernst; Theunissen, Georg; Mühl, Heinz. Pädagogik bei geistigen Behinderungen: ein Handbuch für Studium und Praxis (Education for intellectual disabilities: A manual for study and practice) (in German). p. 149 publisher=W. Kohlhammer Verlag. ^ "Geistige Behinderung - Normtheorien nach Speck und Goffman.". Heilpaedagogik-info.de. Retrieved 2014-05-12.